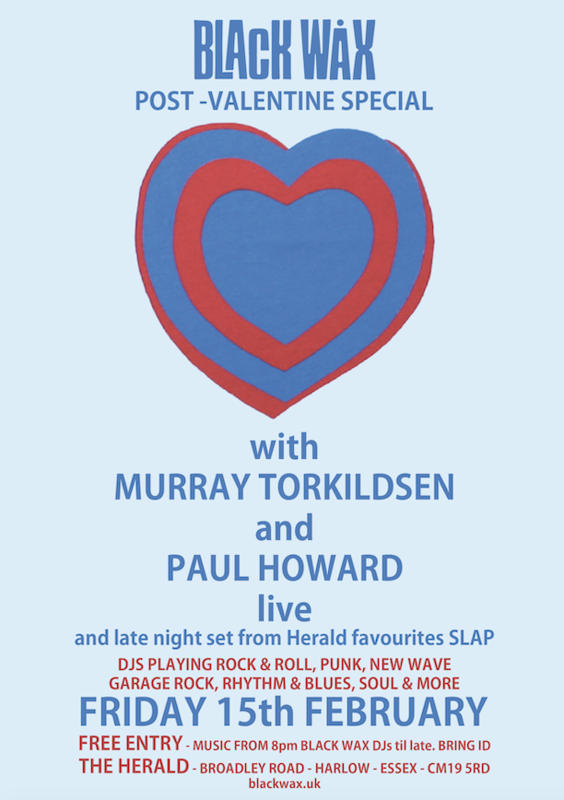 A POST-valentine special with live music from Murray Torkildsen and Paul Howard with special late night set from Herald favourites Slap. Murray Torkildsen – a Murray solo show is always full of surprises, be it accompaniment from a rewired child’s toy or a guitar made from a music venue bar. But what is no surprise is the quality of musicianship and songwriting on show. Known around town and further afield for his work with the bands Real by Reel, The Redwoods, The Sweeney and more recently Popdad, Murray is also guitarist for self-proclaimed ‘Rock & Roll’s greatest failure’ John Otway. This job took Murray to Caribbean island Montserrat in 2016 where the John Otway big band became the first band to record on the island since the Rolling Stones in 1989. Expect songs from across Murray’s musical career. Paul Howard – A regular around Harlow’s pubs with his musical partner of 35 years, Jo Clack, Paul also ventures out as a solo artist in his own right. With a back catalogue of songs from his time in The Tender Trap and The Liberty Cage and more recent material composed with Jo, Paul’s shows are always a varied mix of musical emotion. Pop sensibility, punk attitude and a voice to silence even the rowdiest of bars, Paul can have you wiping away tears with one song, and dancing on a tables with the next. Black Wax DJs will be playing a mix of Punk, New Wave, Rock & Roll, Glam, Rhythm & Blues and Soul on original vinyl. The night will conclude with a late night set from Herald favourites Slap.